Bold and rich, with a touch of holiday spice. 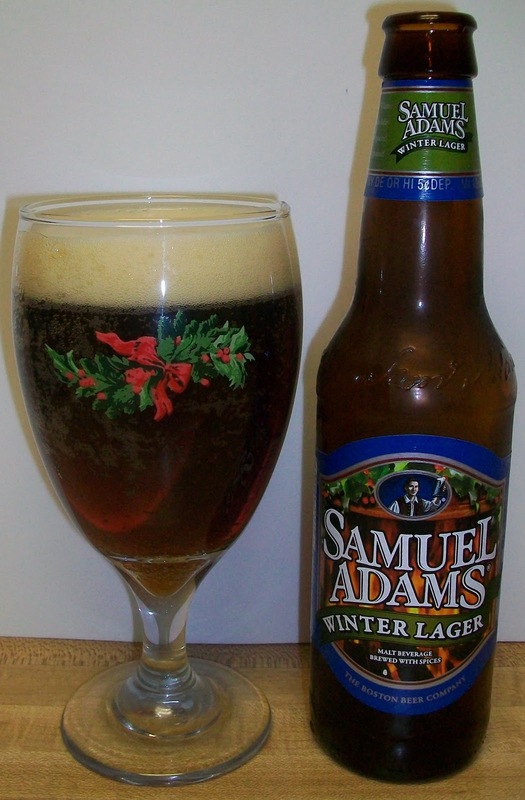 The first thing one notices about a Samuel Adams® Winter Lager is the deep ruby color. Then comes the magical aroma which promises something special on the tongue. The cinnamon, ginger, and hint of citrus from the orange peel blend with the roasty sweetness of the malts to deliver a warming, spicy flavor. On the palate Samuel Adams Winter Lager is rich and full bodied, robust and warming, a wonderful way to enjoy the cold evenings that come with the season. I saw this at the store a few weeks ago and figured it was worth buying one to do a more formal review. I am also curious if they have changed this any for 2010. The beer pours a clear dark amber color with ruby hues and a fairly rich off white head. The nose is nice with some caramel almost toasted malt aromas a hint of spice and with a gentle swirl of the glass a very nice floral hop aroma and citrus notes are also present. Not bad, not bad at all. This is a very drinkable beer. It light for winter lager or bock but it has some very good flavors in it. The taste starts out with sweet caramel malts up front, then a pleasant effervescence over the tongue in the middle of the sip. The malt and spice flavors start to build slightly as you get to the top of the swallow. This is very easy drinking with an effortless swallow. The finish has some nice flavors; sweet almost toasted malts, notes of spice and some citrus along with a light floral hop finish. The hops are just enough to dry a little without any bitterness. The final after taste is, well, I want to say harsh but I don’t mean that in a bad way. It is a typical none-smooth or non-ale like lager finish. That’s not bad it’s just the way it is, lagers typically are more harsh or harder than ales. All and all this is pretty good beer. I was a little tough describing the finish and final aftertaste but this is not bad. I think this is better than last years. I don’t want to describe this as complexity but there is more going on with flavors in this year’s beer. The malt flavor intensifies a little as it warms. It also is getting a little harsher as it warms. None the less there are still some interesting notes in this beer. I’m going for a C+ on this one. There is a slight harshness or hardness on the finish and final aftertaste that’s keeping me from giving it a B. I am very pleased with this brew. There is nothing over the top or exceptional, it is just a nice drinkable dark lager or bock with some interesting notes.